The new Attack fishing shoe from Huk is one of the most impressive fishing/water shoe I have worn. Huk has invested quite a bit of time and energy into the quality and design of these shoes. 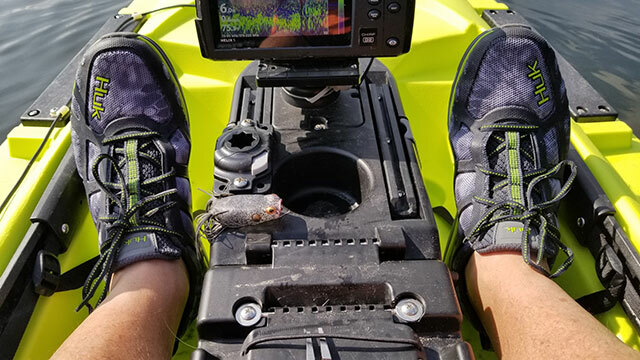 Introduced at the 2017 ICAST convention, the Huk Attack shoe feature GripX technology for solid traction when in your kayak, boat or on wet surfaces. The Fuzetek design creates a durable upper unlike any other shoe and is described by Huk as “bulletproof”. The Attack’s laces feature Performance Lacing, preventing your laces from becoming loose. I was able to go all day without worrying about my laces untying. Once wet, the shoe drains 360 degrees, allowing your feet to dry as quickly as possible. While originally designed for fishing, these shoes are comfortable both on and off the water. The price of these shoes is high at $84.99, but it’s a small price to pay for dry and comfortable feet. For more information, please visit www.hukgear.com.